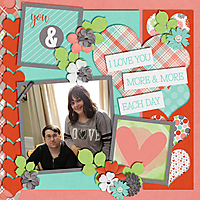 What sweet photo and fun cutwork hearts! Love the word tags and pretty well placed clusters! Great job on the template! I like how you used the same red paper on each side. Cute title work, too.